Short Product Description: A lovely blend of eucalyptus and spearmint essential oils to start your day with a refreshing lift in the shower. 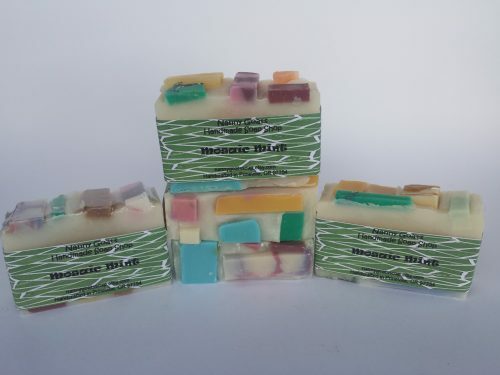 Mosaic Mint is made with unscented pieces of soaps that have been cut into unusual shapes then laid out in layers to give a uniquely mosaic appearance. 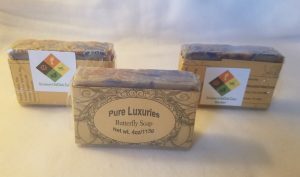 Beautifully scented with eucalyptus and spearmint essential oils and fragrances for perfectly balanced harmony. The scent is fresh, clean, crisp and eye opening which makes it the perfect bar to have in your morning shower. If you’re dragging your rear in the morning this one will perk you right up and send you bouncing happily out the door to start your day. Goat’s milk and olive oil provide you with a luxuriously thick, creamy lather that conditions and nourishes your skin with vitamins you skin craves so feel free to indulge in this craving of soapy loveliness.